QUITO, Ecuador, February 6, 2012 (ENS) – The world’s second largest oil company, Chevron Corporation, has filed an appeal seeking review by Ecuador’s National Court of Justice of local and appellate court decisions holding the company liable for $18 billion for pollution of the Ecuadorian Amazon by Texaco Petroleum from 1964 to 1992. Based in San Ramon, California, Chevron Corporation merged with Texaco Petroleum’s parent company, Texaco in 2001 to form ChevronTexaco, Inc. In 2005, ChevronTexaco changed its name back to Chevron Corporation. 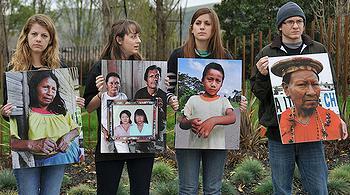 Chevron alleges that the lower court’s judgment is unlawfully premised on fraudulent and scientifically baseless evidence; that the judgment ignores the releases of liability granted to Texaco Petroleum Co. by the government of Ecuador following a cleanup of Tex Pet’s share of remediation sites in the 1990s; and that the judgment awarded punitive and other damages never requested in the plaintiffs’ complaint and not allowed under Ecuadorian law. In addition, Chevron has served the government of Ecuador with a notice of arbitration for alleged breaches of the United States-Ecuador Bilateral Investment Treaty. On February 11, Chevron will ask a panel of three private lawyers named as “arbitrators” under the Bilateral Investment Treaty to nullify the lengthy Ecuadorian court process that a year ago found the company liable for an $18 billion cleanup of Amazon land and waters. Pablo Fajardo, the lead attorney for the approximately 30,000 Ecuadorian plaintiffs, wrote in a January 24 letter to Ecuador’s Attorney General Diego Garcia Carrion, that such a move violates international law, Ecuador’s own laws and Ecuador’s separation of powers doctrine. to order Ecuador to mandate the affected communities and their representatives not take steps to enforce the judgment. 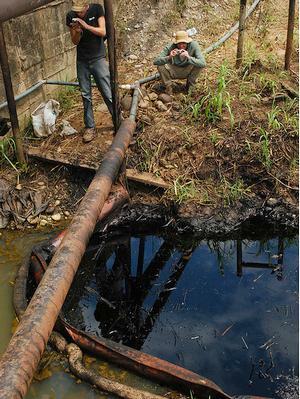 After eight years of litigation, in February 2011, Ecuadorian Judge Nicholas Zambrano in Lago Agrio found that Texaco Petroleum had deliberately discharged more than 16 billion gallons of toxic “water of formation” into Amazon waterways. The toxic water poisoned rivers and streams used by local inhabitants for drinking water, harmed indigenous groups and caused a steep increase in rates of cancer and birth defects, among other health problems, Judge Zambrano found. The judge ordered Chevron to pay $8.6 billion in damages and $860 million in attorneys’ fees, and issue a public apology or pay an additional $8.6 billion penalty. An Ecuadorian appellate court affirmed the decision on January 3, 2012. Chevron has refused to pay, citing corruption and collusion between the Ecuadorian courts and the plaintiffs, which made a fair trial impossible. Chevron executives have vowed never to pay, despite having promised U.S. courts that the company would abide by rulings of the Ecuadorian judicial system as a condition of moving the trial to Ecuador in 2002. The per capita income in Ecuador is only $4,000 per year, and the cost of cleanup for each adult Ecuadorian would amount to a one-time $1,200 tax, according to Fajardo. An international law jurist from Peru has issued a letter to UN Secretary-General Ban Ki-moon, asking for a review of Chevron’s “egregious misuse” of the investment treaty to evade its $18 billion liability in Ecuador, according to a letter released to thousands of arbitration specialists around the globe. 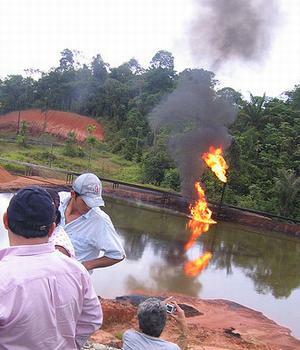 Jose Daniel Amado, a specialist in international arbitration, told the secretary-general that Chevron’s latest attempt to deny the legal claims of the rainforest communities, “stands in direct violation of international law” and would “quash” the fundamental human rights of the 30,000 Ecuadorian citizens who initially brought suit against Chevron in the United States in 1993. “Chevron has constructed what appears to be a calculated plan to manipulate a commercial investment dispute system to evade the outcome of a private litigation,” wrote Amado, who has served as a consultant to the Ecuadorian plaintiffs. Chevron is attempting the arbitration panel gambit after losing its case not only in the two Ecuadorian courts but also losing in the U.S. Court of Appeals for the Second Circuit in New York on January 26. “That court rejected Chevron’s efforts to declare the Ecuadorian judgment invalid and unenforceable and instead ordered the New York trial court to dismiss Chevron’s claim for injunctive and declarative relief in its entirety,” said Smyser.